Opera's Jesus Phone play is more clever than you think. Yesterday, the Norwegian browser makers let it be known that at next week's Mobile World Congress in Barcelona, they will publicly unveil an iPhone incarnation of their Opera Mini mobile browser. The general assumption is that Steve Jobs and cult won't actually let the thing onto their handheld status symbol - and that may be the case - but the Norwegians have at least ensured that if the Apple App Store police do reject the browser, they'll have to dig mighty deep into their bag of doublespeak. As it stands, Apple does allow third-party browsers into the iPhone App Store - but only if they use the same WebKit rendering engine as its own Safari iPhone browser. The App Store police have been approving such browsers for about a year. But the Jesus Phone isn't a place where you can run a serious Safari competitor. There's no Opera, Firefox, Chrome, or, well, Internet Explorer. Unless they use Apple's APIs or interpreters, third-party iPhone applications are barred from executing their own code . "An Application may not itself install or launch other executable code by any means, including without limitation through the use of a plug-in architecture, calling other frameworks, other APIs or otherwise," reads the terms and conditions attached to Apple's iPhone SDK. "No interpreted code may be downloaded and used in an Application except for code that is interpreted and run by Apple’s Published APIs and built in interpreter(s)." These two famous sentences also bar Adobe Flash and Java from the Jesus Phone - not to mention the imminent Apple iPad. With these draconian conditions in place, Mozilla won't even attempt a browser for the iPhone. " Mozilla director of community development Asa Dotzler tells The Reg that the open source outfit has no interest in taking Firefox where "it's not wanted." And though Opera has admitted to prototyping an iPhone version of Opera Mini in the past, it never actually submitted the browser to the iPhone App Store. In fact, it still hasn't submitted the browser to the App Store. And chief development officer Christen Krogh tells The Reg that the company hasn't been in touch with Apple over the matter at all. Never mind that when we sat down with Opera co-founder Jon von Tetzchner in the fall, he seemed to hint that Apple talks were in the works. 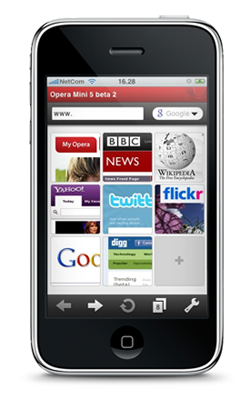 But Opera has now completed a version of Opera Mini for the iPhone. And it will unveil the thing before submitting it to the App Store - an apparent effort to force Apple's hand. And force Apple's hand it will. Yes, Opera Mini is normally a Java application. But the iPhone version runs natively - and it will not interpret code. Like existing incarnations of Opera Mini, the iPhone version taps into proxy servers that intercept and compress webpages before sending them down to the client. This speeds download times - making the browser ideal for slower web connections - but it also means that Mini doesn't run its own webcode. "The proxy servers take down web content and transcode it into a compressed and static content format," says Krogh. "There is no code execution or any scripting language running on the client." From where Opera is sitting, its new browser does not violate Apple's SDK. That's why the company has chosen to port Mini to the iPhone, and not its Opera Mobile browser. And that's why the company believes Apple will approve the thing. "We're not being cheeky," Krogh says. "We think they will approve it. The way we read the requirements and regulations, it clearly falls within that category of applications that can be approved...and it really is a different thing than iPhone Safari. It saves bandwidth. It makes it possible to surf the web when you're roaming on a network outside your native geography. And it's faster." Why hasn't the company tried this in the past? "We figured we would synchronize the delivery of Opera Mini on the iPhone platform with the next generation of Opera Mini and Opera Mobile [on other platforms]," Krogh says. "Right around this time, we will be releasing Opera Mobile 10 on a number platforms and we're releasing Opera Mini 5 for J2ME, BREW, and other platforms." OK. Fine. Mini 4 was released in November 2007, before Apple allowed third-party applications on the device. And Mini 5 offers a completely revamped user interface, including tabbed browsing and other new tools. But why didn't Opera submit the browser to Apple before unveiling the thing at the world's biggest mobile trade show? Krogh chuckled before answering. "Every year at the show, we show our latest and greatest [browsers] to the world. And we want to do that again this year. And due to timing issues, this is the way it happened." We still say the company is hoping to force Apple's hand. And we back the attempt wholeheartedly.